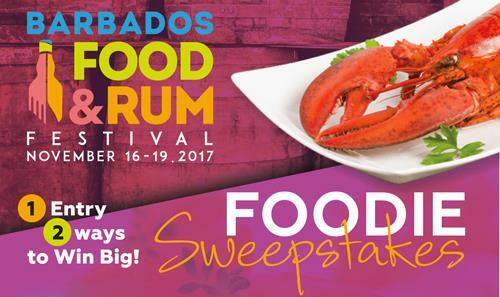 Only visitors to the island of Barbados during the Barbados Food and Rum Festival period - November 16th –19th, 2017 are eligible for this prize. First Prize Details: 2 Season Passes and hotel transfers to and from event for the Food and Rum Festival 2017 (November 16th - 19th, 2017). Season Passes* inlcude access for 2 persons to the following events - (Taste of the Exotic, Taste the Spirits of Polo, a specified Dinner Safari and the Feet in the Sand Beach Party) - First Prize winner will be annouced Friday 17th November at 12pm. This prize is open to all Barbados fans living overseas. Only those persons traveling from Barbados international source markets are eligible to collect this prize. Please see full list of eligible countries in below. How long will this promotion run for? Entry for the First Prize - Persons who will be in Barbados from between November 16th – 19th 2017 will be able to submit their information to the entry form provided from the 11th – 15th November 2017 . Entrants must indicate which hotel they are staying at while on island. The Frist Prize Draw will take place on November 16th, 10:00 am (-4 GMT) and the winner will be announced on our Food and Rum Instagram and Facebook Pages. All persons who have successfully entered their submission for the First Prize will be automatically entered for a chance to win the Grand Prize in 2018. Entry for the Grand Prize – This prize is open to all Barbados fans living overseas. Persons will be able to submit their information to the entry form provided from the 11th November 2017 – 15th August 2018. Only those persons traveling from Barbados international source markets countries are eligible to collect this Grand prize. Please see full list of countries in our Terms and Conditions below. Anyone over the age of 18 year old are able to enter this promotion. Must satisfy travel conditions including possession of valid travel documents, any necessary visas and availability during stipulated travel times. Sweepstakes are limited to Barbados International gateways Countries and Cities. Persons living outside these gateway cities will have to pay for the cost to get to they particular gateway airport or forfeit the Grand Prize. Any employee of the Barbados Tourism Marketing Inc are not eligible to enter. BTMI reserves the right to substitute prizes with another prize of comparable value or cash equivalent in the event that it is unable to provide the intended prize. BTMI hereby specifically reserves the right to terminate, cancel, suspend and/ or modify the promotion if any fraud, virus or other technical problem corrupts the administration, security, safety of the promotion, as determined by BTMI in its sole discretion. Travel dates may vary due to flight availability and accommodation. BTMI cannot be held responsible if any or all included prizes are unavailable for any reason, including any natural or unnatural occurrence. BTMI reserves the right to at any time vary the terms of the Sweepstakes, to amend its Terms and Conditions, or to withdraw the Sweepstakes. In any of these events notice will be given via media advertisements or messages to customers or via its social media platforms and will be effective immediately or as of the date referred to in such notifications. Specific travel periods apply to Sweepstake Grand Prize winner the Barbados Food and Rum Festival Sweepstakes dated– 15th – 18th November, 2018. Travel dates may vary due to flight availability and accommodation. Barbados Tourism Marketing Inc. reserves the right to post, publish or otherwise use any personal information or content entered in this promotion.